# Date :- 12 August ; 2018. # Venue:- Anfield, Liverpool, England. # Timing :- 06.00 pm (India) & 01.30 pm (England). LIV Team in Great Form. This is quality Team and Chance they will show their Character. Win, Win, Win, Win, Loss (W, W, W, W, L). WHU Team in a quite Good Form and Chance they will continue good Football this Premier League. Draw, Win, Draw, Win, Loss (D, W, D, W, L). # Statistics Of Both Team [ Head to Head ]. 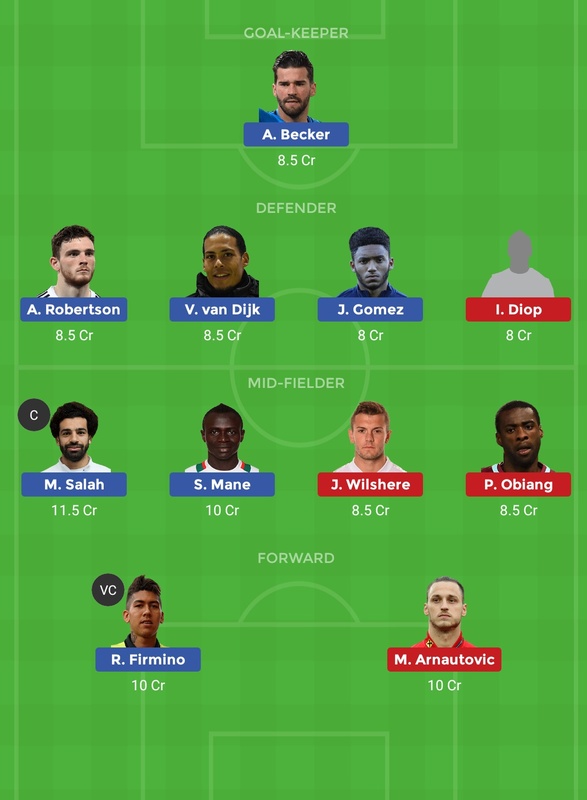 Alisson Becker, Nathaniel Clyne, Andrew Robertson, Joseph Gomez, Virgil Van Dijk, Mohamed Salah, James Milner, Robert Firmino, Georginio Wijnaldum, Naby Keita, Sadio Mane. Lukasz Fabianski, Ryan Fredericks, Aaron Cresswell, Issa Diop, Angelo Ogbonna, Pedro Obiang, Jack Wilshere, Mark Noble, Felipe Anderson, Andriy Yarmolenko, Marko Aratovic. 4. Joseph Gomez / Virgil Van Dijk. 1. Ryan Fredericks/ Pedro Obiang. *** NOTE :- You Can Change Your Captain, Vice Captain & Team according to Your own opinion.